Kilmelford and Kilninver community are celebrating a good start to the New Year with the successful installation of roof top solar panels on their Village Hall. Courtesy of a grant from the Carraig Gheal Wind Farm Community Benefit Fund (Fund), the wind has effectively helped harness the power of the sun to ensure the village hall’s electricity bills are kept as low as possible. The grant application came in to the Fund’s Steering Group in November 2015 with a plea to turn round the application quickly so that the installation could happen before the electricity support tariff dropped again making the project uneconomic. All credit to the community for providing the information required and to the Steering Group for moving quickly to process the application. 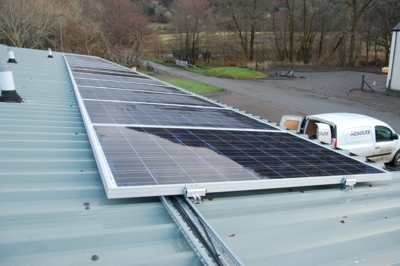 The installation was aided by the flexibility and speed of installation achieved by Scottish based Company, Absolute. The Carraig Gheal Wind Farm is 50% owned by Alloa-based GreenPower (International) Ltd and 50% by the Ampere Equity Fund. GreenPower is a successful independent renewable energy developer; projects range from single turbines to multi-megawatt grid connected wind farms. Ampere Equity Fund is managed by DIF a leading independent fund management company who manage investments in high-quality infrastructure assets, including renewable energy projects. The Carraig Gheal Community Benefit Fund is worth £46,000 per annum. The wind farm first became operational in November 2013 and GreenPower makes contributions to the Fund twice yearly (in April and October). The Steering Group for the Fund was established early in 2015 and the first round of the Fund was launched in October 2015.